(NAPSI)—We all love art—music, painting, literature, theater, dance. All these things bring us joy and enrich our lives. But art also plays a very important role in healing. Art therapy is becoming an increasingly effective way to treat trauma, especially among our country’s wounded warriors. Music, writing and visual art therapy programs at military care facilities are proving beneficial in producing calming effects for those suffering from brain injuries, post-traumatic stress syndrome and other conditions. According to the Defense Department, nearly 350,000 U.S. military personnel have been diagnosed with traumatic brain injuries since 2001. Though modern military equipment and body armor have reduced mortality rates, roadside bombs and other explosive devices have inflicted injuries that have our service members struggling to function once they get home. Studies have shown that creating art can decrease stress hormones, which can relax and lessen anxiety. Service members often deal with a complex set of feelings and emotions because of what they have experienced in combat, and that makes it difficult to relate to friends and family members. The invisible wounds can lead to feelings of shame, guilt and identity crises that might cause them to retreat and engage in isolating behaviors. 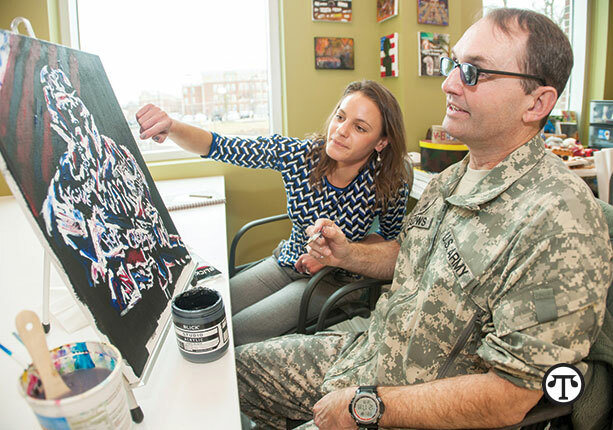 Creating art to express feelings and help them externalize what they might have repressed for a long time can help service members resume a normal existence. The Military Healing Arts program is a partnership between the Department of Defense and the National Endowment for the Arts (NEA). NEA grants help fund a military “healing arts” network. The results have been so promising that plans were made to extend the program to 12 more facilities across the country this year. However, possible cuts to the NEA in the upcoming federal budget process may put such programs in serious jeopardy. To find out how you can voice your support for the Military Healing Arts program and other programs that benefit from NEA funding, see StandForTheArts.com. Stand for the Arts is an initiative of Ovation TV.